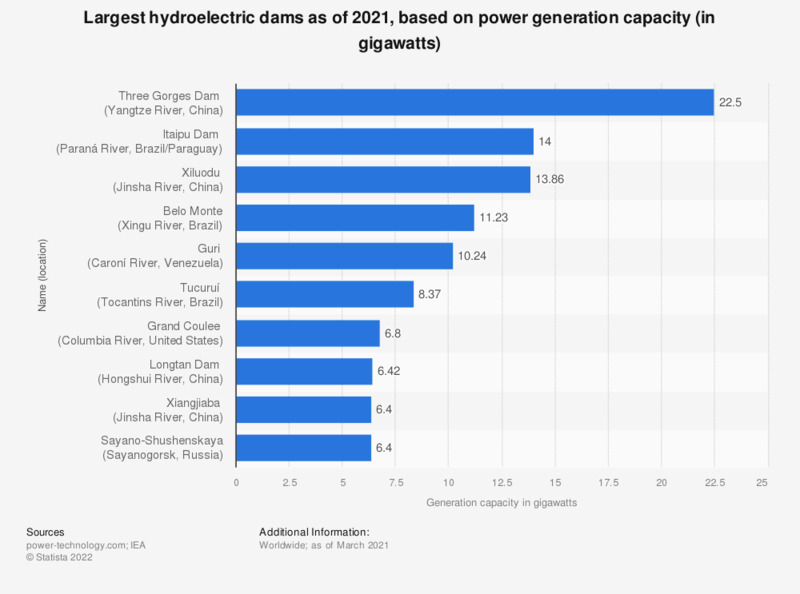 This statistic displays the world's largest hydroelectric dams as of 2017, based on generating capacity. During this year, one of the largest hydropower facilities was located along the Columbia River in Washington, United States; it had a generating capacity of 6.81 gigawatts. China is by far one of the strongest supporters of hydroelectric energy in the world. It is one of the cheapest energy facilities to maintain due to low operation costs. In the United States, the average expense for operating a hydroelectric power plant was about 8.4 mills per kilowatt hour in 2015. As of 2016, China accounted for 28.9 percent of global hydropower consumption. Four of the world’s top ten largest hydroelectric dams are located in China; the Three Gorges Dam on the Yangtze River is considered the largest dam in the world and has a generating capacity of 22,500 megawatts. It is located in the Hubei province and was completed in July 2012. In addition to generating electricity, the dam was built with the intention to increase the river’s shipping capacity and reduce flooding downstream. The dam was expected to cost some 180 billion yuan but four years before completion, spending had already reached almost 150 billion yuan. There have been many controversies surrounding the Three Gorges Dam, including over 1.2 million people being displaced, as well as a number of cities and cultural sites being flooded. The project is also fraught with environmental problems, such as the erosion of riverbanks that have caused landslides and threatened fisheries in the East China Sea. The reservoir flooded over 632 square kilometers of land at its completion. In 2012, China generated 872.11 terawatt hours of electricity from hydropower. Figures were compiled from several reports. Everything On "Hydropower industry" in One Document: Edited and Divided into Handy Chapters. Including Detailed References.